Love is in the air! Who says you have to spend big bucks on Valentine’s Day to show your love? Bargain hunters love anyone who appreciates a good value. There are many lovely deals for friends, family and sweethearts to enjoy without breaking the bank. The offers are valid on Thursday, February 14 at participating locations, while supplies last. Restrictions and exclusions may apply, so check first before making plans or ordering. If you’re dining alone, you can still take advantage of BOGO FREE offers — just take the extra entrée home for dinner or lunch the next day. Hungry “cheapskates” do it all the time. Looking for ways to spend Valentine’s Day in Denver? 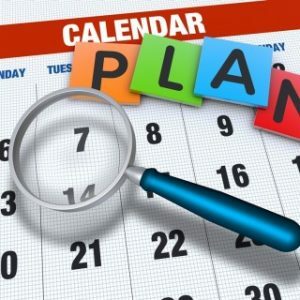 Check out this list of lovely events. Our bargain-loving cupids will update the list, as more deals are confirmed — so check back often! Auntie Anne’s – Enjoy a buy-one-get-one FREE heart-shaped Original or cinnamon sugar pretzel — coupon required. Applebee’s Grill + Bar – Get DOLLAR HURRICANE for just $1 through March 5. The adult bargain beverage is served in a 10-oz. mug with a lovely fusion of rum, passion fruit, orange, black cherry and lime. Barnes & Noble – Those locations with an in-store café are offering Café Bakery Valentine’s Offers, from February 9 to 14. Red velvet cheesecake slice for $2, sugar cookie for $2 and red velvet cupcakes (4-pack) for $9.95. Baskin-Robbins – Share its limited-time Love & Kisses Sundae with someone special for just $5. The lovely treat is available all month long. Chili’s – Perfect frugal date night — enjoy an appetizer, two entrées and a dessert for $25. Add one of its monthly margaritas (The Grand Romance) or Classic Presidente margarita for just $5 more. 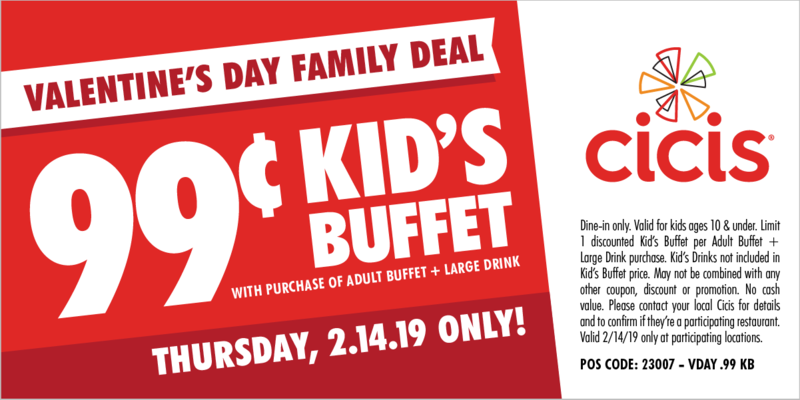 Cicis – Kids (10 & under) get buffet for 99¢ with purchase of adult entrée and beverage — coupon required. Denver Art Museum – Get 10% off all jewelry in its gift shop — through February 14. The offer is also available online, but, unless you spend $75 or more, be prepared to pay for shipping. Denver Clerk and Recorder’s Office – Say I do and get hitched for FREE at the Denver Clerk and Recorder’s 12 Annual Valentine’s Day Celebration. It’s certain to be a lovely affair! Denver Zoo – Enjoy half-price tickets online all month long, including Valentine’s Day. Dollar Tree – Rather than spend $5 on a single balloon at the grocery store, stretch your balloon budget at Dollar Tree. The store sells foil balloons in many shapes and colors for just $1 each, including Valentine’s Day and heart-shaped balloons. Harkins Theatres – See a special screening of The Notebook for just $5 at 7 p.m.
Hooters – Get 10 FREE boneless wings with the purchase of any 10 wings by shredding an image of your ex in-store or online at hooters.com/ShredYourEx. King Soopers – Sweet savings with a buy-one-get-one FREE sale on Russell Stover’s Chocolates (8.25- to 12-oz., select varieties) — get one for the spouse/partner and give the second to mom/grandma. Macaroni Grill – Save 25% on e-Gift Cards (up to $250) with promo code VALENTINE. The offer is valid through February 13. Purchase now for a perfect and frugal Valentine’s Day lunch or dinner date. McAlister’s Deli – Family date night! Up to two kids (12 & under) eat FREE with the purchase of an adult entrée — valid for dine-in or carry-out. McDonald’s – Get Valentine Friend Treat Pack for $1, with 12 coupons for a FREE item for kids (12 & under) — available through February 14 at select locations. Papa John’s – The pizza shop is serving a medium, one-topping heart-shaped pizza (on a thin crust) for $11. You can also pair the pizza with brownies for an additional $5 with promo code BEMINE — $16 total. Papa Murphy’s – Heat up the kitchen with its HeartBaker pizza for $9. Make it a sweeter deal by adding cookie dough for a few extra bucks. 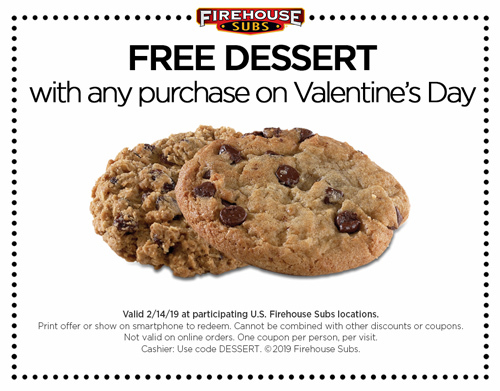 Pizza Hut – Fresh from the oven, the pizza shop is serving a Valentine Bundle — medium, one-topping heart-shaped pizza and Hershey’s cookie or brownie for $16.99. You can also get just the heart-shaped pizza for $11.99. Either offer is only valid with its hand-tossed crust. Potbelly Sandwich Shop – Single? The sub shop is giving a FREE cookie to any customer without a significant other. Qdoba Mexican Eats – Buy an entrée and get a second one for FREE (of equal or lesser value), when you share a kiss with anyone or anything — even yourself or a photo of your celebrity crush. Snarf’s Sandwiches – Enjoy a buy-one-get-one FREE sandwich with a loved one. Show the cashier you follow them on social media (Instagram, Facebook or Twitter) for the condiment-filled deal. Sprouts Farmers Market – Get one dozen roses for $12.99. The price is valid through February 13. Starbucks – Share a buy-one-get-one FREE handcrafted espresso beverage (Grande or larger), after 3 p.m. — open to Starbucks Rewards members via the app only. TCBY – Get buy-one-get-one 50% off frozen yogurt and toppings at HighPointe Park (9645 Washington St.) in Thornton — coupon required. The coupon is valid through February 21. Trader Joe’s – One of the best prices on a dozen roses in town is at the grocery store — $12.99 per dozen. Please tell me where these mcdonalds books are! I’ve searched high and low in year past….no dice…..
That is a great deal at Snarfs but I cannot find BOGO on Instagram or FB. Can you help me with a direct link? Michelle. On Valentine’s Day you show up at any Snarf’s Sandwiches on Valentine’s Day, February 14, go the counter and like Snarf’s Facebook or Instagram page. Need last minute flowers? Lucky’s Market has them for ten dollars a dozen. I would call first to make sure they are not sold out. There are 3 Lucky’s Markets in Boulder, and 1 in Longmont, can’t vouch for any other locations in Colorado, as I don’t live in or around the Denver area.